The things they read. | Saying things about books. Last weekend was the summer version of the semi-annual Harvard Bookstore Warehouse Sale. Mike, my boyfriend, had been asking me when it was happening, so when I got the email with the date, I knew Saturday was booked. The staff was friendly as usual, overly grateful for the crowd’s patience with their slow computer system. They passed out free water and bite sized candy bars. I chose a Snickers while I stood in line holding Steve Almond’s Candyfreak, which I’d found in the used section of the warehouse and thus paid 60% off the cover price for. 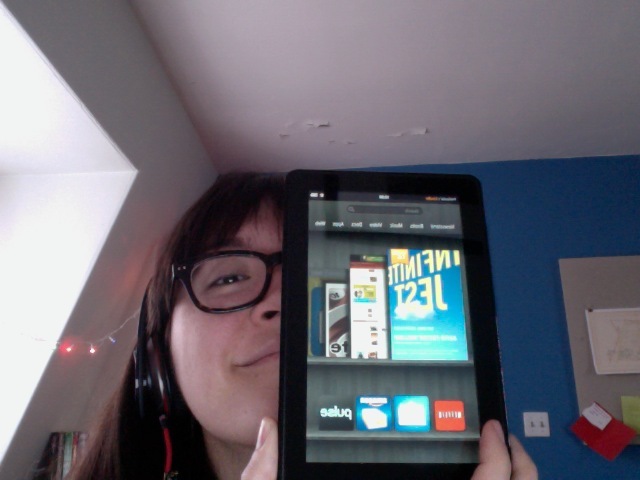 Take that, Amazon. Mike’s on summer vacation, and has been venturing further into the world of reading physical books rather than listening to audiobooks all the time. Our porch and the weather has thus far complied, letting us sit for hours in each other’s presence, racing the setting sun as we just finish one more chapter, only speaking to one another to share a funny-but-out-of-context-and-so-not-funny portion or ask what a word means. It’s my favorite kind of bonding, of the nerd variety. We read on the porch Saturday night after the sale, and then again on Sunday. On Monday, I took the bus that runs in front of my apartment rather than walking the few blocks to the T, all so I could read more about small, independent, suffering candy companies across America, and hoping Steve Almond would drive by to see someone reading his book. I’m one of his fangirls. I finished the book on Monday night, which means that in three days, I ingested more book-per-day than I had in a long time, and also more chocolate-covered almonds/pretzels than I meant to. 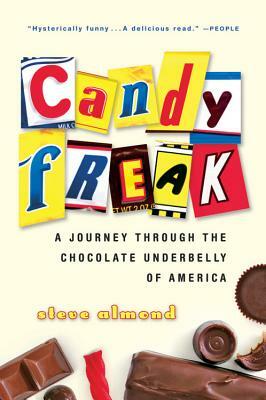 If you don’t like chocolate, small companies, introspection, or Willy Wonka, this isn’t the book for you. This is like the book version of Willy Wonka and the Chocolate Factory, if, you know, there wasn’t already one. Here’s a grown man, known for his humor and deadpan manner, who becomes a groupie for candybars. And not your run-of-the-mill Snickers and Butterfinger variety. Almond (he points out the irony of his last name) goes on a pilgrimage to the remaining independent candy companies, and–get this–tries Peanut Chews, Goo Goo Clusters (I especially appreciated this southern shout-out), Twin Bings (ew) straight off the line! But most of all, what Almond accomplished with this book, is to make me stop into more convenience stores, stare at their candybar selection disapprovingly, and walk out, leaving the person behind the counter wondering what I stole. This little film is the perfect reason to nerd out this morning. I’m pretty sure this is what happens at Harvard Bookstore every night. Love Raymond Carver hanging out in the window as the shopkeeper leaves. I’m convinced that Poets & Writers compiled their most recent Inspiration Issue just so I would renew my subscription. What else could explain the reason I am currently reading the magazine cover-to-cover, something I don’t think I’ve done with any other magazine subscription. At first, I thought that the magazine’s arrival was perfect timing for my impending travel to Georgia for the holidays. Then, on the plane, I realized that it was perfect timing as my last issue of my previous subscription. I don’t know what made me persist, what made me rise on icy mornings, shake myself awake and perch by the coffeemaker. When people said I was disciplined, I knew the truth. It would take more discipline to stop writing than to continue. Then there’s Frank Bures’s “Inner Space: Clearing Some Room for Inspiration” with a take on technology’s infringement on the writer’s creative space that is not accusatory, but rather empathetic, gentle. With humor and just the right amount of personal anecdote, Bures presents a very real obstacle to the issue’s subject of inspiration without pointing fingers or damning Google. I suppose I’ll get back to finishing the issue, and my internal struggle of to renew or not to renew. I finally got around to reading an interview a friend sent me a while back. Avi Solomon of Boing Boing interviewed Jack Zylkin, inventor of the USB Typewriter. I remember hearing about this thing back when he first announced it to the world, typewriter nerds everywhere rejoiced, including me. But there seems to be something deeper at work here. More than just some mad scientist who’s fusing the past and future in some unnecessary but novel creation, Zylkin is trying to preserve something that our increasingly fast-paced lives are losing room for. The key is that Zylkin isn’t trying to do away with the conveniences of, say, an iPad; instead, he’s trying to highlight the benefits of a typewriter — nostalgia, sure, but also focus and tangible results — while taking advantage of data backup and storage. “The other thing is that technology today is so disposable! For example, no one thinks about passing down their iPhone3 as a family heirloom (they probably are selling them to buy iPhone4s) but the typewriters I work on have been around for about 100 years and still look and work great! A man after my own heart. Read the full interview here. Aaaand we’re back! After a week in Georgia with family, I came back to a snowstorm and a brand new job. The snow mostly affected Western and Central Massachusetts, so we were merely inconvenienced while walking to get our pizza, but some people have been without power this whole week, my boyfriend’s family included. It might have been a more productive week had we lost power, though, but instead I vegged out each night, watching scary movies and going to bed early. That all ends this weekend, when I plan to start Infinite Jest. I’m working on a review for The Last Werewolf, but until then I’m soaking up all kinds of technical books at my new job. I can say that XML in a Nutshell by Elliotte Rusty Harold and W. Scott Means is understandable for a complete n00b like myself, and I felt prepared when I was being trained on how we use the XML program that we do. I’m currently working my way through Adobe InDesign CS2: One-on-One by Deke McClelland, but it’s helping me learn the program by actually using it, which is always the best way for me. Anyway, I don’t want to completely bore you with all of the technical reading I’ve been doing. Is anyone participating in NaNoWriMo? One of the TNGG: Boston writers is covering it, and I’m excited to hear some of the interviews he gets.